What is Forensic Psychology and when do you need it? Forensic Psychology is “the provision of psychological information for the purpose of facilitating a legal decision (Blackburn 1996)”. 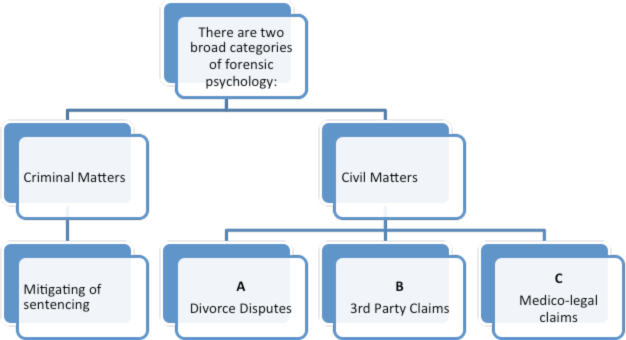 In essence, Forensic Psychology refers to the application of psychology within a legal context and the task of the Forensic Psychologist is to assist the court in making decisions. Our Forensic Psychologist at the Psych Matters Family Therapy Centre in Bedfordview deals in all three areas of Civil Matters. Divorce can be a defining moment in any child’s life – how this will impact your child will depend on how you choose to deal with the challenges that the divorce has left. Parents usually become so absorbed in the bitterness as well as the logistical ramifications related to divorce, that they often miss getting to understand how their children view this major life change. Although divorce impacts the entire family and extended system, this traumatic period is the most pivotal time for you, the parent, to see the world through the eyes of your child. As it is well-documented, divorce is recognised as a traumatic and stressful life event usually affecting the adults involved, however, a child of divorced parents also experiences stress, but lacks the emotional expression, cognitive understanding and coping skills to adjust to this major life event. Understanding how your child experiences the divorce will help you identify and address potential problems early. In many divorce proceedings, some form of dispute needs to be addressed, often leaving both parties angry and bitter, which has an impact on clear decision-making. It is then recommended that a Forensic Psychologist be consulted to assist both parties with an objective view and to assist you and your family in the decision-making process keeping the best interests of your child in mind. In terms of the new Children’s Act 38 of 2005, and the Children’s Act Amendment Bill of 2006 signals a shift from the concept of parental power over children to the concept of parental rights and responsibilities for children. The Children’s Court has been given increase jurisdiction by the Children’s Act, but issues such as guardianship, remain in the jurisdiction of the High Court. The “best interest of the child” is a Constitutional Right and a Forensic Assessment aimed at determining Primary Residency is conducted in terms of the best interest of the child. Collateral information form significant others including domestic workers, relatives, siblings, therapists, schools. Family courts and attorneys request both Mediation and the compilation of a Parenting Plan in line with the new requirements for a divorce procedure. The Mediation sessions include tailoring a Parenting Plan to meet the needs of the unique family and in particular the children. The number of sessions is usually determined by the family and the level of co-operation exercised between parents. While mediation usually occurs pre-divorce although some issues can be addressed during or after a divorce. Child-inclusive-mediation (CIM) is an effective method of determining how parenting can be implemented to meet the child’s unique and specific needs. Depending on the age of the child, the child is consulted with regards to the finalisation of the Parenting Plan. B. 3RD PARTY CLAIMSA Parenting Plan contains particulars of aspects pertaining to the care of, contact with, financial responsibility for, and incidental matters related to the raising of the child/children that are being conferred by the mother or other person having parental responsibilities upon the biological father or other person having an interest in the care, well-being and development of the child. This involves claims which require a psychological assessment for a claim, usually as a result of inter alia, emotional damage, which may have resulted due to negligence or damage by a third party, e.g., wrongful arrest, injury sustained on public transport etc. These claims are usually as a result of a motor vehicle or pedestrian accident and claims are usually made to the Road Accident Fund by relevant attorneys, who consult with relevant psychologists.